Jordi Savall continues to astonish and delight with another release of a variety of music from the early baroque era. 'Ostinato' brings together various composers of fame such as Purcell and Ortiz but we also have some intriguing items from Merula and Valente, both composers of seminal importance in the days of Italian musical glory. Purcell's Sonata and famous 3 Parts upon a Ground are beautifully interpreted with the latter particularly characterful and energetic, especially with Pedro Estevan's brilliant percussion. 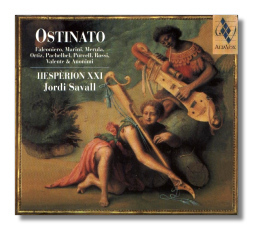 I have recently listened to Biagio Marini's lovely music on a Chandos CD but these musicians have this music in their blood, this is a glorious Passacaglia. The "Greensleeves to a Ground" Variations are another crucial discovery, brilliantly interpreted by Hespèrion XXI. All the items that follow are superbly recorded and wonderfully played with the usual lavish packaging and notes that are part and parcel of AliaVox's releases. Wholeheartedly recommended to lovers of this epoch of music.